Jared Diamond is a professor at UCLA and his book "Guns, Germs and Steel" attempts to explain why European and Asian civilizations, as a whole, have survived and conquered others. The book's title is a reference to the means by which European nations happened to conquer populations of other areas and maintained their dominance, often despite being vastly out-numbered – superior weapons provided immediate military superiority (guns), diseases weakened and reduced local populations, making it easier to maintain control over them (germs) and centralized governmental systems promoted nationalism and powerful military organizations (steel). 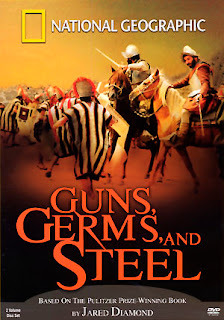 The book uses geographical factors to show how Europeans developed such superior military technology and why diseases to which Europeans and Asians had some natural immunity devastated populations in the Americas and elsewhere. The Wikipedia entry can be found here. The book spawned a documentary which is available on YouTube. This is the first episode.